Kichijoji is home to two wonderful farmer's markets. Both are small, but good fun and filled with plenty of promise for growth. The first is the Earth Day Market (Rescheduled from last week until the end of summer. The website doesn't say why, but here's hoping we get to do more organic shopping just around the corner.) in Inokashira Park and the second is the regular market closer to the station. 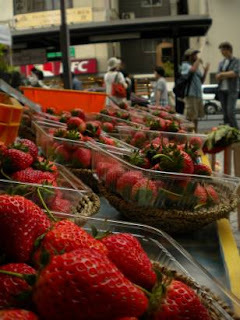 On this weekend, the Kichijoji Farmer's Market aims to please and surely will. Read my overview of the market and head on over with shopping bags in hand. You're bound to find plenty of good fruit, vegetables, and fun! It might also be worth noting that strawberry season here is just starting to kick it. Be prepared with proper packaging to lug home some of these luscious beauties. Know of a market in or around Tokyo? (Or Japan for that matter. We're making summer travel plans now.) Don't hold back! Tell all and make your local farmers glad.